Now, when you are at the login screen of a website, from your Android device, click Share and choose Keepass2Android. This will launch the program. 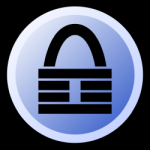 Switch to the Keepass2Android keyboard and log in to KeePass2Android. It will use the shared address to do a search on your database. If it finds a match, it'll return to the program and be ready to sign you in. If there are multiple possibilities, it will present them. You select which one you want, and you'll be able to simply click user and password to sign in. Another good reason why I like this constantly improving implementation of KeePass.